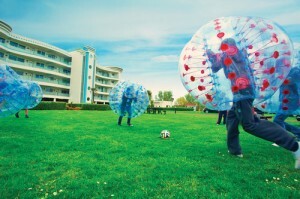 We know that everybody enjoys a good kick about, at Butlin’s, we don’t do ordinary, which is why one of the many unique activities we offer on our resorts is Zorb football! This exhilarating experience combines your traditional football, with the high-energy act of Zorbing, perfect for those who have a passion for sport and trying something new, and it’s included in the price of you break – fabulous! How does Zorb football work? Imagine yourself playing a traditional game of football against your friends… Now imagine that you and your friends are covered in a big, bubbly Zorb ball! With your complete upper body engulfed in the Zorb, you’re left with only your legs to do the work, which is a little difficult without your arms for balance! You and your friends won’t be able to control the laughter as you bounce around the football pitch, bumping into each other! Are you up for the challenge? Here’s some facts you may not know about the art of ‘Zorbing’ – the activity that our Zorb football derives from! 1. The greatest distance traveled by a Zorb ball in a single roll is 570m, just over 1,870 ft. The record was set on November 7th 2006 in New Zealand by Steve Camp as part of Guinness World Records Day. 2. Zorb balls can handle almost any surface no matter how bumpy or slippery they might be. Rides can take place on snow, ice and even water. 3. Zorbing first entered the Concise Oxford English Dictionary in 2001. 4. The Zorb ball was first conceived in 1994 by Dwane van der Sluis and Andrew Akers. Have you ever been Zorbing, or even had a go at playing our own Zorb football? We would love to hear what you thought! Sadly, that concludes our A-Z Blogging Challenge! We hope you’ve enjoyed this journey as much as we have! Maybe you have a favourite post from this month? 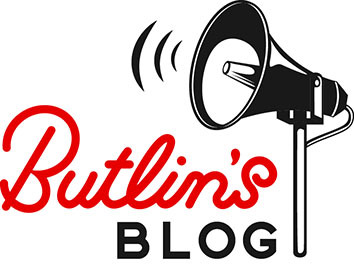 You can Facebook us or tweet us @Butlins.